The latest Blue Plaque to commemorate the achievements of Blyth residents has been unveiled by the town’s mayor. Female footballer, Bella Reay played at centre forward for Blyth Spartans and England between 1917 – 19 scoring an amazing 133 goals in one season. After World War One, women’s competitive football was generally unaccepted in public circles making her playing achievement even more remarkable. Born the daughter of a coal miner in Cowpen at the turn of the 20th century, she worked in a munitions factory and played football during the First World War when competitive league football in Britain was suspended. Matches were played between amateur teams to raise morale, entertain and collect charitable funds. The football team, using a variety of names including Blyth United Munitions Ladies, Blyth Spartans Ladies and Blyth Spartans Munitionettes, was formed in August 1917 by women working as dockers and munitions workers at the South Docks in Blyth. Munitionettes’ Cup (officially called the Alfred Wood Munition Girls Challenge Cup). The team played at Croft park, the home of Blyth Spartans AFC. In later years, Reay played for several local teams including Cowpen, Cambois, and Blyth. 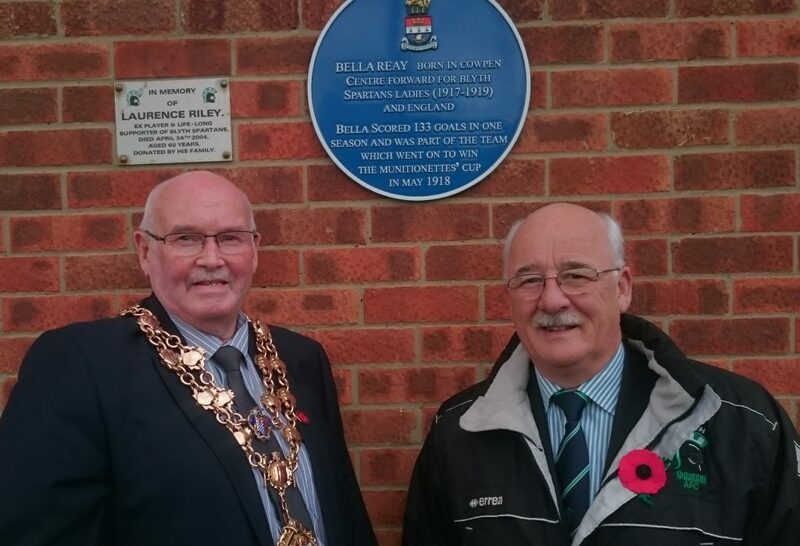 The blue plaque was unveiled by Blyth Town Council’s Mayor, Councillor Adrian Cartie and Blyth Spartans Club Chairman Tony Platten.